Is this correct now ? @ Rough: I wasnt having a go at you. I was stating that "Vision Soft" is enough to say that its a different group perhaps. You misinterpreted what I said. Where do I state this is the reason? I simply know more than you. 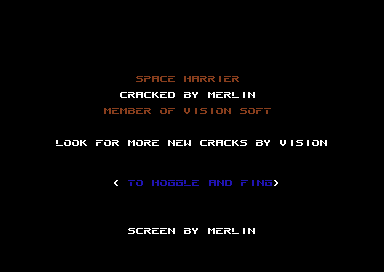 Vision (NL) was founded in 1988, take a look at the intro scroll and read the greetings, also this Vision Soft was greeted by several groups around 86/87 in their cracks. The screen shot says "Vision Soft"...thats enough evidence for a new group entry ?!?!? It's a very different Vision. 100% for sure. Not much to cheer for. I'm not sure if this is the same Vision, can anyone verify/deny it?